Three companies submitted proposals, with Renew Phoenix and Polyfuel shortlisted. Renew Phoenix, part of parent company Renewlogy, was recommended by city staff, according to a Jan. 31 document. The City Council has not yet voted on the recommendation. 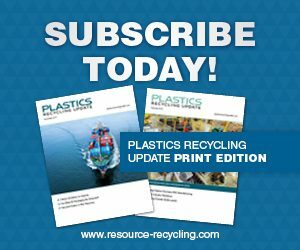 In Renewlogy’s process, scrap plastic is shredded and fed into chemical reforming equipment, which converts long polymer chains into short ones, according to the company. The system produces a number of products, including naphtha, a mix of hydrocarbons that can be further processed into a number of chemical products. The company has a processing system in Nova Scotia, in partnership with waste management company Sustane. Renewlogy also has a facility in Salt Lake City, and the company is putting on a campaign targeting marine plastic debris in India. The latter effort is receiving support from the Alliance to End Plastic Waste, a major plastic waste consortium announced last month. Renew Phoenix has been in development since before the city issued the call for proposals. Renewlogy in 2017 was awarded a grant from the Arizona Commerce Authority through the organization’s Arizona Innovation Challenge program, funds the company planned to put towards developing a Phoenix plastics-to-fuel facility. The Renew Phoenix operation plans to start up this year and will have a processing capacity of 6 million pounds per year, according to Renewlogy. Renew Phoenix was also previously selected to be part of the Resource Innovation and Solutions Network (RISN), a group of public and private stakeholders working to advance recycling-related initiatives. The network is a joint project by the city of Phoenix and Arizona State University. Resource Recycling previously touched on the project in a print edition feature article. Part of the RISN project is a physical space next to the city’s 27th Avenue Transfer Station, called the Resource Innovation Campus. The city’s initial request for proposals for the 3-7s program indicated the winning submission would ideally locate at the RIC. About 1 million pounds of mixed plastics are captured through two city-owned MRFs each year. But the city’s solicitation added that there are an estimated 26 million additional tons of mixed plastic in the city’s garbage and recycling streams each year. Part of the goal of the diversion program is to increase recovery of those landfilled plastics.